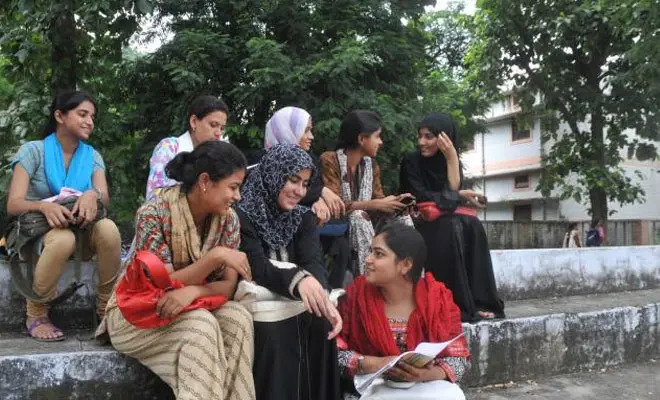 On March 12th, the University Grants Commission (UGC), the statutory body in charge of determining and maintaining the standards of higher education in India, released new guidelines that drastically cut funds up to 40% for Women Studies Centers across the nation. Why is Women’s Studies (WS) the target of the current government? How does the budget cut affect the discipline of WS? How is feminism a political threat? Women’s Studies emerged in India as a discipline in the 1970s from the women’s movement which attempted to make women visible in history through the interdisciplinary frameworks of gender, race, and class. It extended feminist ideas in the university and explored issues such as violence, caste and religious discriminations, female feticide, dowry deaths, and pay disparity. It questioned the production and distribution of patriarchal knowledge and refuted the gender binary reinforcing the idea of gender performativity. Centers for WS were set up across India and funded by the UGC under the 12thYear Plan (2012-2017); WS was recognized as an important discipline that needed to be institutionalized and supported for changing the perception of women and highlighting their contribution in socio-economic development. Despite the UGC recognizing WS as an important discipline, there has been a recurring disapproval of the discipline by critics from right-wing politics. Critics of WS believe that the discipline is an indulgence for women. In 2003, the National Democratic Alliance (NDA), a party led by the Bharatiya Janat Party (BJP), a right-wing political party heading the current Indian government, sought to rename Women Studies Centers across the nation as Women and Family Studies Centers as part of the 10th Year Plan, hoping that a change in name would deter feminist agendas. A few years later, a survey in the state of Tamilnadu in 2006, under the All India Anna Dravida Munnetra Kazhagam (AIDMK) government, an ally to the NDA, examined WS in many universities across the state and concluded that WS courses were often regarded as “soft options”. It stated that WS ended up getting students who did not get admissions into core disciplines while questioning the discipline’s significance and impact in the real world. It is indeed distressing to see how the right-wing questions the significance of WS in a culture where sexual harassment is normalized and trivialized. When Indian women broke their silence on social media with the #MeTooMovement in 2018, the government remained silent and refused to take action on sexual harassers, endorsing male supremacy. With thousands of women, like the journalist Priya Ramani and the actress Tanushree Dutta, shaking the skeletons out of their closets, the #MeToo movement drew attention to patriarchal oppression at home and at the workplace. However, the fundamentalist non-secular right-wing dismissed the cases focusing instead on the “saffronization” of the nation and the glorification of Hinduism. In the present political scenario, it is not surprising that WS suffers a drastic budget cut. Women and minority studies are a threat to the political right-wing as they question patriarchy and casteism, which are the fundamental tenets of the party. With a cut in funds in higher education, admissions will be limited, and tuition will increase; education will become unaffordable for students from underprivileged backgrounds and higher education will become elitist. The temporariness accorded to Women’s Studies and Dalit Studies, among other social science disciplines, through UGC funds, is a way of institutional marginalization. By withholding funds, the government controls the circulation of feminist thought and reinforces patriarchal oppression. The government’s nationalistic vision of “New India” as a superpower with global hegemony is an extension of upper-class Hindu patriarchal ideology; it is imperative therefore that WS is recognized as an important discipline, and women are viewed as equal, in times that celebrate inequality as power. Let’s hope that the upcoming election in May 2019 will bring about an equal and diverse India. 25% of the world’s prisoners. This is the same America that is home to 5% of the world’s population and produces 27.8% of the world’s greenhouse gases from fossil fuel, according to the National Environment Trust. Pollution and incarceration reveal a dreadful, man-made reality. For both prison and pollution, the United States tries to change its image rather than face up to the reality. The United States is the primary source of world pollution and of prison practices. A prison binge has been built on the disregard of women, of people of color, of the poor. High levels of pollution have been built on absurd consumerism passed off as a social good. Meanwhile, for many, these add up to a cruel reality. United States administration after administration has produced more laws to incarcerate more people and more “Acts” to cover up the high level of emission of Green House gases and other pollutants. Images of poor people, especially of women of color, abusing the welfare became as visible as the images of the destruction of the “Commons” became invisible. What one hand giveth, the other taketh away. In her lecture, Ruth Wilson Gilmore talked about the reality of incarceration. Her book, The Golden Gulag Prisons, Surplus, Crisis, and Opposition in Globalizing California, started as a community project: a research for Mothers ROC (Mothers Reclaiming Our Children) in California, women who know too well the reality of and reasons for incarceration. They needed “a non-lawyer activist with research skills, access to university libraries, and a big vocabulary, to help them.” Gilmore fit the bill perfectly. In her book, Gilmore relocates the two laws that sent the Mothers’ children to prison—the Street Terrorism Enforcement and Prevention Act and the “three strikes and you’re out” law—into their historical political economic context. Ruthie, as everyone calls her, presented on the particular history of capitalism in the United States, the story of opportunity fertilized with inequality and racism. Her lecture was called “What Would Harriet Do? Unfinished Liberation or the Dangers of Innocence”. Harriet Tubman’s story exemplifies the root of the social and racial American construction. For Gilmore, Tubman was a designer and a political artist. Tubman’s story of unwavering determination to bring slaves of the south to freedom speaks directly to today’s “zero tolerance.” As the false stories told of African and African-derived people helped to justify the slavery of thousands of women, men and children of African descent, so today’s false story of “zero tolerance” attacks African Americans. 65 million people are currently banned from employment because of previous convictions, and those people live in the communities that most need steady employment. Again, the discussion focused on the construction of images, from the witch-hunt that put women back in the “domus,” to the “Reaganomic” image of the welfare-queen that re-segregated poor and working African American women, thereby legitimating the re-appropriation of power and global capital. Welfare-queen became pathology. To unpack that pathology, we must learn to study “the genealogy of the phrase,” and thereby reinforce the importance of historical consciousness. Gilmore brings to light the reality of the political economic project that requires mass incarceration. That project is genocidal, and that project of mass incarceration speaks directly to the situation of health care and reproductive rights in the United States. I am not saying that we live in a true totalitarian regime. That is not the question. The question is whether we understand that these ‘all-guilty’ laws work to control and subjugate certain sections of the population, such as the African Americans, Native Americans, immigrants, and also women. Of course, women intersect with the other “guilty” populations. In many states, laws limiting women’s reproductive rights are blossoming, and punishment and incarceration await the women who try to secure or wield their rights. At the same time, the story of Trayvon Martin’s assassination fits this framework of being eternally guilty. His corpse was tested for drugs and alcohol. His shooter never had to be tested and is still alive and free. There are many other stories that show that the current rule of law is an active political-economic tool. Ben Saperstein and May Young, two activists from North Carolina, attended the seminar with Gilmore and Moshenberg. They were there to learn and exchange ideas for their own struggle. They are involved with the Greensboro Legal Fund, which works to bring to light the fate of members of a Latino organization that has been wrongfully accused of racketeering, and has been incarcerated for political reasons. The exchanges among activists and scholars from North Carolina, Washington, New York and beyond showed the importance of research working with activism. In this time of neoliberal surge, as Žižek remarked, “what unites us is the same struggle”. In this struggle, Ruth Wilson Gilmore’s inspirational work reminds us of the importance of excellent scholarship as a means of resistance.